Air emissions from animal agriculture operations and manure storage include gases and particulate matter (dust). Some of these are potentially hazardous (hydrogen sulfide and ammonia). Others are scrutinized because they are greenhouse gases (carbon dioxide, methane, nitrous oxide) and others because they are odorous. 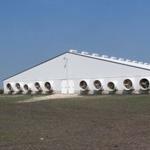 All in all, hundreds of gases can be emitted from manure and animal housing. The materials on this page were developed to assist educators and professors who include an introduction to airborne emissions and their management as a topic in their classrooms or educational programs.